Outdoor Storage – Solved! - Columbia Builders, Inc.
A shed is a great outdoor storage solution that can fit your family’s needs. 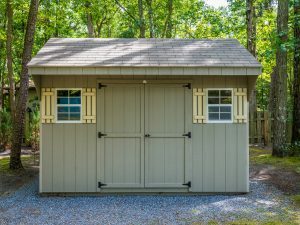 Cleaning and stowing your lawn and garden items for the coming winter might be easier this year with the addition of a garden or storage shed. An ideal solution for equipment, tools, and furniture that many of us often struggle to store, garden sheds not only free up valuable space in your garage and basement but can add charm to your backyard as well! Before you add any structure to your property, you’ll need to confirm the regulations within your community and town for doing so. If your home is part of a homeowner’s association, make that the first step in your research. Learn the architectural rules and the process for submitting your plans. Next, you’ll want to check with your local municipality to determine if a permit is needed and what setbacks and other details are required. Determine the size shed you need based on the space you have available in your backyard, and your storage needs. If there is limited square footage to work with, consider a shed with a loft that will provide additional space – it’s a perfect spot for bulky lighter weight items like chair and lounge cushions. You have many options for your new shed, including whether you hire a contractor to custom-build on site, to ordering a pre-fabricated style to your specifications, and even purchasing an “off-the-shelf” shed at your local home improvement center. Custom sheds will take longer to construct, and cost more than pre-fab and pre-made units. The choice is yours, depending on your budget, needs, and what appeals to you aesthetically. One of the most challenging aspects of owning a shed is keeping it neat and tidy. You’ll want to keep the things you need to use within easy reach. Wall hangers, shelving units, and plastic bins can help you avoid a cluttered and disorganized space, along with a periodic sorting of anything that is broken, duplicated or simply not used. Remember to recycle or donate useable items! This entry was posted on Friday, October 5th, 2018 at 10:03 am. Both comments and pings are currently closed.